A municipal engineering chief on his way home was shot multiple times in a hit in Songkhla. The official had been transferred to an inactive post previously and had only recently returned to his job. Dead at the scene from six shots that hit his body was Kamon Sinuan, 46. 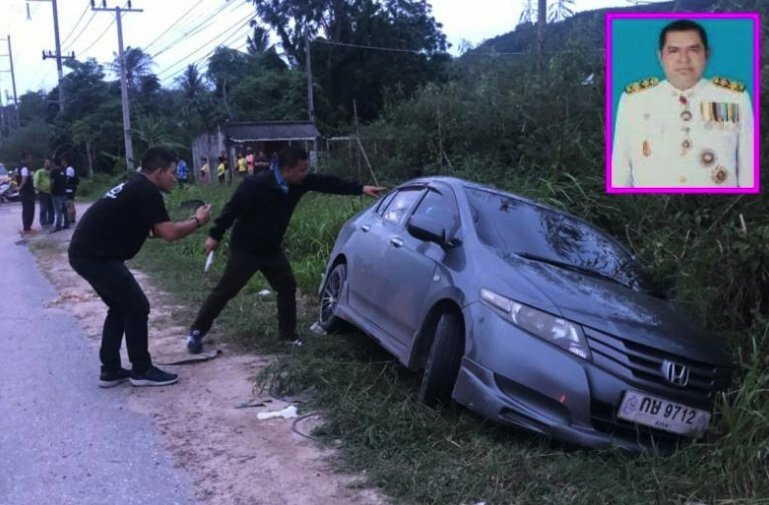 At least 13 shots were fired at his Honda City as he drove home from the municipal offices in Singhnakhorn district of Songkhla. Witnesses said a car followed him then shots rang out causing the driver to veer off the road. Police believe that two shooters were involved. They discovered that the engineer had been transferred under a cloud and had only recently returned to his desk. Thailand is a mafia nation state. A Thai woman I know told me her brother is a police general and she can have anyone she wants killed. She was serious. I said "Here is the short list. how much?" I best not upset you then.your welcome to stick my mrs on it though and I'll chip in.